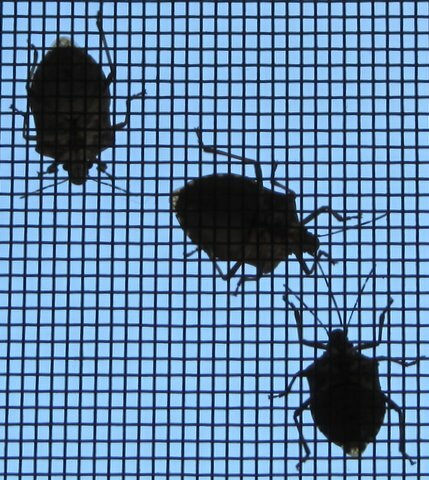 What’s the latest news about the battle against the brown marmorated stink bug (BMSB)? Finding the answer was one of my goals when I attended two 90-minute sessions in which entomologists addressed the BMSB issue at the Annual Training Day for Master Gardeners at the University of Maryland, College Park, last Tuesday. The news is both positive and discouraging. Research at numerous universities is almost on a “war footing” basis, but overall the news is not good for the 2011 crop year. 1. The BMSB may be the worst pest in 40 years. The mid-Atlantic states are the current epicenter, but the bug is a good hitch-hiker and has been found in more than 30 states, where BMSB populations are expected to increase each year. BMSB’s probably have two generations per year in the mid-Atlantic states but may have up to five generations per year in states with milder climates. 2. Fifty scientists in several states are studying various aspects of the problem. Pesticide trials begin in about two weeks. Scientists will meet next month to report research findings. 3. Crops affected include apple, pear, peach, tomato, pepper, eggplant, corn, soybean, berries, cucumber, and cotton. Flowers include chrysanthemum, snapdragon, sunflower, and zinnia. Woody plants include maple, gum, and nandina. 4. Organic growers are at greatest risk, and some, especially fruit growers, this year may be faced with near-total crop failures. 5. Biological controls in the form of small, Asian wasps (“stingless” for humans) that prey on the BMSB may be the best solution. The USDA is experimenting with several species, but they may be released in 2013 at the earliest, and only if they do not negative impact on native species. Potential North American insect predators have not yet affected BMSB populations in significant amounts. 6. Most pesticides are not labeled for BMSB control. Current, less risky pesticides may be less effective than older, high-risk pesticides. Pesticide risk often is also high to beneficial insects. Insecticidal soap causes high mortality of BMSB nymphs, but not of adults. 7. Companies may begin selling traps originally designed to attract BMSB’s for study. These yellow traps will be studied to see if they, as adapted for sale, are effective controls. At this point the pheromone used in the trap as a lure is that of a BMSB relative, not of the BMSB. 8. Here’s a link to the latest fact sheet (March 2011) for garden centers from the University of Maryland Extension about BMSB. It contains color photographs and information on the following subjects: life cycle, feeding habits, protecting indoor plants, dealing with BMSB in houses, outdoor control options, and a report on research involving parasitic wasps. CLICK HERE. 9. Here’s a link to the University of Maryland Extension Home and Garden Information Center’s publication on the BMSB. CLICK HERE. Additional information: Here’s a link to a recent (May 20) University of Maryland Extension’s Grow It Eat It blog posting describing a “low tunnel” made of PVC pipe, rebar, floating row cover, clothesline, twine, stakes, duct tape, and bricks (as anchors) to protect “short” veggies from the BMSB. CLICK HERE. As surprising in our backyard, no BMSB to date. Looks like prevention plays a major role. Keep the fingers crossed. I wish you well, Nicolas! Yes, prevention–such as limiting places they can hide over winter–is a key, but there are trillions out there. Yes, fingers crossed here too! hide over winter ? Yep. I saw that.